3. Jacksonville Jags – Amari Cooper WR Alabama – Dante Fowler Jr OLB Florida – And now the fun begins, with Fowler going here, look for Washington to make a surprising move maybe a trade or Shane Ray . Because Oakland picks should be Williams or Cooper. 4. 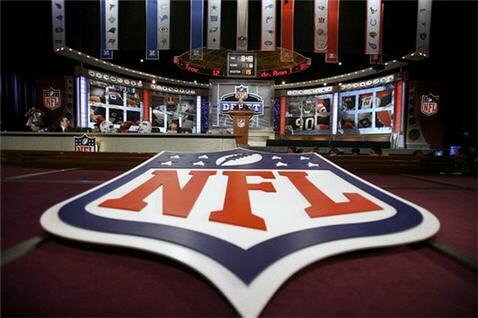 Oakland Raiders – Leonard Williams DT USC – Amari Cooper WR Alabama – Not really surprised here, Good fir for Oakland, Washington should take Williams here but Shane Ray and Bud Dupree could be picks here. 5. Washington Redskins – Dante Fowler OLB/ DE Florida – Brandon Schreff OT/OG – Kind of surprised but I respect the pick, really adds versatility to their line. 6. New York Jets – Brandon Schreff OT/OG Iowa – Leonard Williams DE USC – Steal. Steal. Steal. 8. Atlanta Falcons – Shane Ray DE Missouri – Vic Beasley OLB Clemson – Never listen to rumors. 9. New York Giants – Todd Gurley RB Georgia – Ereck Flowers OT Miami– I had expected Schreff but then heard otherwise, regardless a very good pick by the Giants. 15. Minnesota Vikings – Nelson Agholor WR USC – Melvin Gordon RB Wisconsin(Chargers) – pretty sure this was obvious. 18. Arizona Cardinals ( trade with Kansas City) – Randy Gregory OLB Nebraska – Marcus Peters DB Washington – Wrong pick, Wrong player, thought they would address their DB issues. 19. 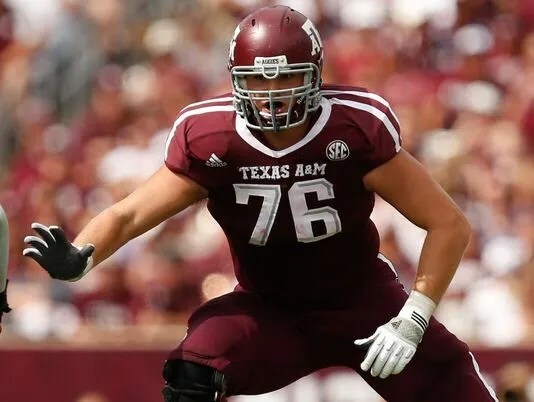 Tennessee Titans – Eddie Goldman DE/ DT FSU – Cameron Erving OT/OG/C – Interesting pick by the Browns here, not really focusing on helping Johnny but Erving can play some football and is the most versatile linemen I have seen in a while. 27. Dallas Cowboys – Kevin Johnson CB Wake Forest – Byron Jones CB UConn – supreme athlete, good pick for dallas, finally addressing their long needed CB woes. What Sam brings to the table is an amazing first step; his burst off the line is could be one of the best I have seen on tape. His burst is excellent for beating offensive tackles to the edge. 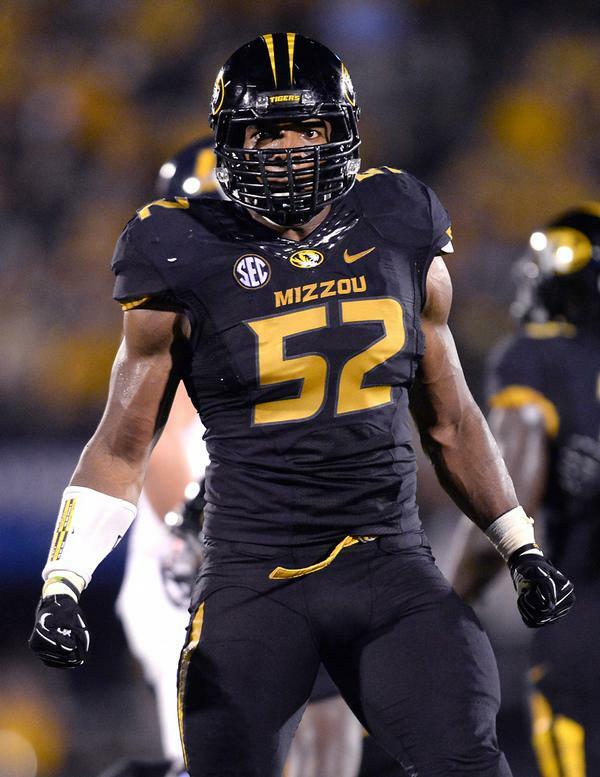 Michael Sam has a driving motor that allows him to chase after the passer in almost all scenarios. Couple that with very high production at the collegiate level and you have a player that is very intriguing for GM’s by all accounts. Sam also has decent arm length which as a DE, is one of the more pivotal physical traits you could have. When you watch Sam on tape, he sparkles in his pursuit of the QB and shows borderline elite closing speed. However there are a lot of Red flags for Michael Sam. First off his very poor combine showing; what we see on tape looks totally different than what we saw at the combine. 4.91 yard 40 and a 10 yard of split of 1.72 is not impressive. Ideally you would want a 1.65 10 yard split from most DE’s/OLBs. Sam also displayed a paltry vertical jump of 25.5 inches, which is lacking to say the least. Those numbers make Sam seem like a marginal athlete. However, when I watched tape of him, I came a way with a bad taste in my mouth. Sam could use his hands a bit more when engaging blockers, he very much relies on his first step to get by and does not use his hand to fight off OL men blocks nor use them to create space with pass rush moves. Michael Sam did not show me a lot of pass rush moves not a lot of rips or swims or spins and seems stiff even when getting to the QB. In the Vanderbilt tape, I saw him literally turn his back to the OL /QB and kinda of flounder with his back turned. That will not be acceptable in the NFL, it won’t cut it. Due the lack of pass rush moves and hand usage he gets jammed at the point of attack a lot, not allowing him to penetrate downfield and thus he can be washed down out of running plays relatively easily. I also have to wonder if Michael Sam’s elite production was due to him or also due to having potential 1st round pick Kony Ealy and budding star Shane Ray ( you will all know his name soon) on the DL with him. Kareem Martain is not a guy a lot of people have a lot of attention on when people look at the top defensive lineman in this draft but he is a potential sleeper that could see a potential rise after a great showing at the NFL combine. In terms of his combine numbers, Martin probably had one of the best if not the best combines. He was top 5 in the drills involving explosion and lower body explosion. 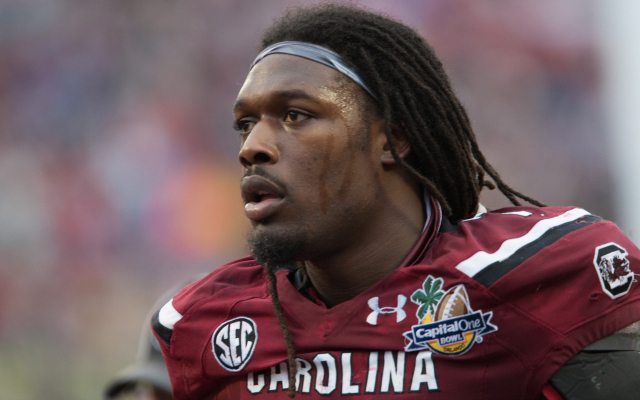 His 40 time was second best to Clowney’s for defensive lineman over 265 lbs, he had a pretty solid vertical jump, but what really stood out was his broad jump which was the best out of the defensive lineman and his 10 yard split during his 4.72 forty was the best (yes even better than Clowney’s) out of all the defensive lineman. The explosion that he shows judging based on his combine numbers is something you get out of a top 15 pick. He’s a solid tackler and understands contain assignments when facing mobile QB’s and understands assignments outside of just rushing the passer despite being a good fit in a 4-3, 5 tech scheme. He also has a solid run defense game and doesn’t allow blockers to get leverage over him on running plays. 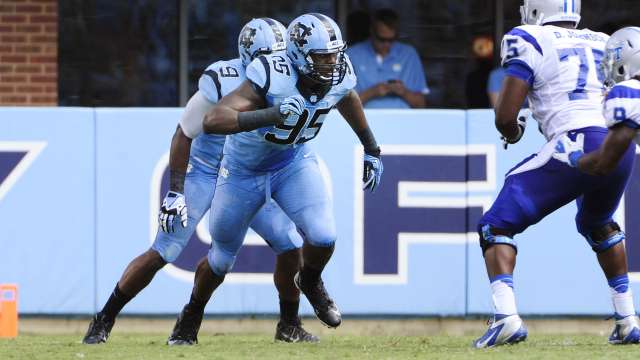 The senior was a defensive captain for North Carolina and was well respected by many of his teammates and coaches. In terms of size Martin is the perfect size for a 4-3 size at 6-5, 272 lbs and his long 35 inch arms. On paper Martin is the defensive end that scouts look for. Kareem Martain on tape never showed this explosion that he demonstrated at the combine during his time at North Carolina. He was often hesitant to engage blockers with his hands and wasn’t really competitive at the point of attack as a rusher. His production was solid for his senior year but he but he got most of it from poor competition and garbage time. He also struggled at the senior bowl in one on one drills and in 11-11 drills according to numerous scouts. In closing, Kareem Martin is a great athlete who just hasn’t been able to translate his god given athletic abilities unto the football field. If he can go to a team with the right team that with a solid coaching staff that will show him how to use his athleticism and hands to step up his game, Martin can be a solid pick up on the second day. 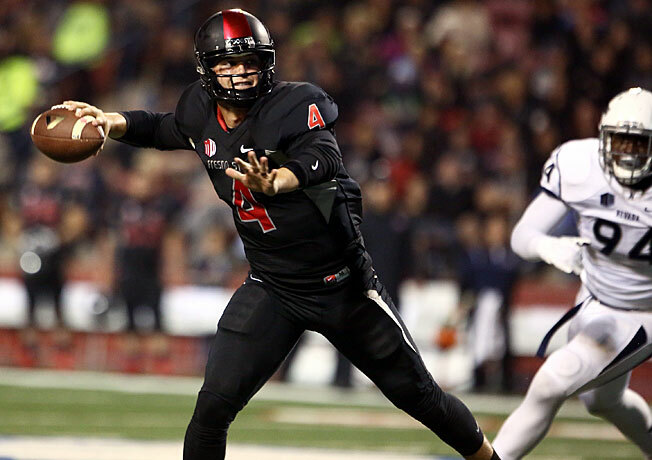 Positives – Derek Carr has the physical tools to succeed in the NFL. Carr has arguably the best zip o his ball in the entire 2014 draft class, this zip helps him fit balls into tight windows on all levels of the field. Carr possesses the ability to make all the NFL throws whether it is short, intermediate or deep. Carr impresses with his anticipation of his WR breaking off their routes and often has the ball out before the WR has begun to look for the ball, this is a testament to his knowledge of the game of football and his general feel for . Carr has more than functional mobility, he moves outside of the pocket very well and keeps his eyes down field and can throw on the run rolling out to the right with relative ease. Negatives – Fresno State does not exactly play the best competition in the MWC and Carr beat up on the inferior competition. However, when he faced USC in the Royal Purple Las Vegas Bowl, Carr look flustered in all facets of his game as the speed of USC confused him. Carr needs to work on his progression, very often Carr makes one read before releasing the ball, some of that is due to their playing style but even outside of the quick passes, Carr will stare down a WR as he waits for the route to develop. Coming with Fresno State Carr played out of the shotgun and does not have experience in a traditional pro style offense. Along with working on his progression, Carr needs to work on his footwork, too often Carr is releasing the ball from his back foot or without opening up his hips or stepping into his throws. This prevents him to getting as much torque as possible on his throws. Derek Carr also seems to struggle heavily against the blitz, all of his footwork issues become compounded during the blitz often leaving him vulnerable in the pocket and often rushing his throws. Carr tends to miss on his deep ball (30 yards down field or more) often leaving balls over WR fingertips or 5 yards in front of them. Summary – Derek Carr has a lot of the tools needed to be an NFL QB, a lot of his negatives can be fixed by simply working on his mechanics. Improved footwork will lead to Carr hitting the deep ball. Working on Carr with looking off defenders and not locking in on WR’s will improve Carr as well. Carr has all the physical tools and also has very good intangibles has he is a very strong leader and smart player. Carr would be better set to be drafted to a team with an established QB and allowed to develop for a few seasons. When I look at Carr’s whole package I see him as early 3rd round talent and if I was a GM I would not touch him until then. Carr did have a strong showing at the Senior Bowl raising his stock with scouts and due to the inflation of QB’s Carr will likely end up going in the 1st round and possibly top 10. Spring practices are over. The grass is cut. Summer sessions are in full swing. College Football is right around the corner. Johnny Football, Marcus Mariota, Teddy Bridgewater, Jadeveon Clowney, Braxton Miller and Sammy Watkins. These players are the stars of college football; they are names that the casual fan knows. Below is a list of 5 players that will have huge impacts on their teams. 5 players who with a single big game could alter the college football season. I give you the 5 unheralded super stars. Dri Archer RB Kent State – Speed, agility, acceleration and did I mention speed? Archer is lightning in a bottle. Dri Archer just might be the fastest player in the NCAA. Coming in 5 ft. 8 and 175, he is diminutive but his timed 4.26 40 speed is lethal. He could play WR or RB in the NFL but regardless of position the goal is going to be to get the ball into #1’s hands, Dri Archer makes Kent State a threat every time they are on offense and he will power the Golden Flashes to a successful 2013 season. Lache Seastrunk RB Baylor– the Baylor RB might be the most complete RB in the class. Seastrunk started out at Oregon but after recruiting violations and other issues, he transferred to Baylor. Seastrunk impressed in his first season at Baylor rushing for 1000 yards and 7 Td’s, after not starting the first 7 games of the season. Lache has great speed, vision and has the power to go up the middle. Baylor has a shot to impress in what could be a wide open Big 12, Lache Seastrunk is pivotal to their success and could be a sleeper for the Heisman. 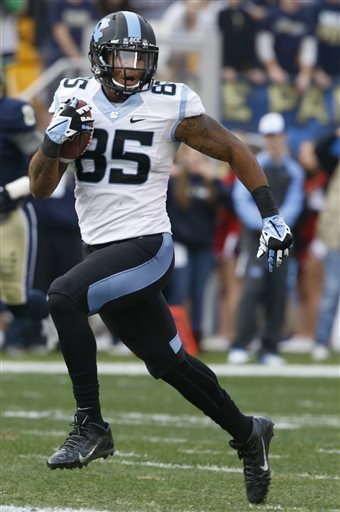 Allen Robinson WR Penn State – Coach Bill O’Brien opened up the offense and let the Nittany Lions air it out a bit more. A huge benefactor of this was WR Allen Robinson. Robinson was QB Matt McGloins favorite target and even though there is some fogginess on who will be the new QB in Happy Valley whoever it is will look to target Allen Robinson. Robinson comes in at 6-3 211, possessing 4.5 speed and great route running. Robinson’s presence on the outside opens up underneath for Penn State’s stud TE’s. Sammy Watkins, Marquis Lee and Amari Cooper are all bigger names but Allen Robinson could very well end up having a comparable season to them. LeMarcus Joyner CB/S Florida State – LeMarcus Joyner is a heat seeking missile, slicing through blockers to make a gigantic hit on a RB or slamming a WR coming through the middle. In 2012 Florida State had 7 or legitimate NFL draft prospects and none may have been more feared than Joyner. Joyner is more than just a hard hitter, he is playmaker getting interceptions, forcing fumbles and even returning a kick or two. Joyner is a bit undersized but that should not hinder him too much. Joyner may be a more NFL ready version of LSU’s Heisman finalist Tyrann Mathieu. I think Joyner might be the best S out of the state of Florida since Sean Taylor. These players may not be known to the casual fan but trust me after the 2013-2014 season they will be, and they will all be playing on Sundays.